Anything is Possible with Feedback! From here, you can begin to provide Feedback. A confirmation of your request will be sent to you. An email will be sent with access to your Feedback History. Kliic lets you personalize and customize assessments to target your unique business needs generating truly meaningful feedback. Brand - Add your logo. Customize - Utilize your competencies. Define - Target critical behaviors. Support - Include suggestions for improvement. Build - Create feedback for Executive's, Management, Sales, and more. Measure - Review the economic impact (ROI) of any feedback. You have complete control over every aspect of the administrative process! Invite - Notify using direct email or an open invitation. Edit - Correct as and when you go! Control - Decide who sees what on the reports. Encourage - Remind participants with a click of a button. Manage - Create unique internal or external accounts. Sort - Add filters to view only what you need to see. Multiple report options are readily available. Individual - Each feedback recipient gets their own personalized report. Organizatonal - Review detailed reports on the Organization (with 1000 raters or more). Consolidated - Consolidate reports to get a snapshot of strengths and areas for improvement. * Focus refers to the number of Competencies and/or Focus Groups associated with the assessment. The Journey to Excellence Starts When You Know What to Change! Individual Self-Development - All of Kliic's individual Self-Assessments are FREE, try one below (see the EXPLORE Tab). Leaders Developing Others - As a manager, coach, or partner, you can support the development potential of others. Organizational Development - Kliic supports organizations engaged in organizational change initiatives striving to achieve world class status. Considering who we are, where we are, and how we want our world to be is the beginning of personal-power. Throughout history, top performers, great leaders, high-performance athletes, and successful people from all walks of life have regularly engage in some form of reflection. When we reflect, we are able to make course corrections, explore new routes and to consider new opportunities. When we don't, we are overwhelmed by a constantly changing world hoping that we can find an island of calm for a short while. The first step in this process is to ask for and receive feedback! Self-reflection and feedback are enablers that move us closer to our true potential. Kliic allows you to begin, continue, and refine your journey toward personal and professional excellence. Leading Others Requires Great Leaders! The Kliic platform helps Executives, Managers, HR Professional, Coaches, Mentors, Clinicians, Psychologist, and Therapists successfully support the development of others. Once all the feedback has been received you can generate a final PDF report and then review the results with the individual to help them begin to plan and execute their development strategy. To enable participants to make positive changes quickly, each final report may also include (where available) general and specific support actions for each competency weakness identified. This may also include links to on-line resources that can help them take the necessary action to improve. Great Organizations Enable Great People! Leaders lead people. They accomplish things through their people. They need inspired individuals, capable followers, and motivated staff. A true leader acts as a powerful force in the development of their people. 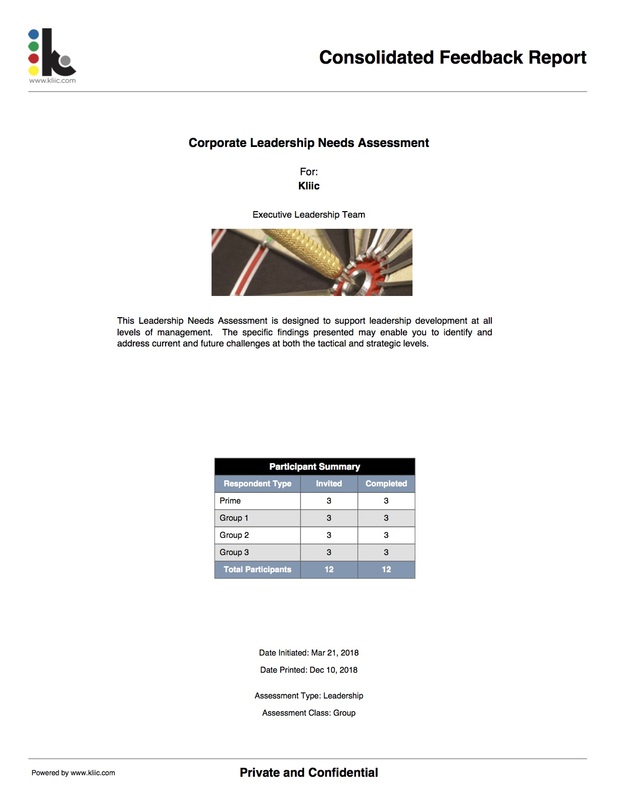 Kliic lets you initiate an enterprise wide corporate needs assessment on any group, iniatitive, process or strategy within the organization. Before you begin any training program, corporate learning project or new strategic direction, first start by finding out where the real gaps are in your organization. Enlist feedback from up to 1000 (or more) participants before you spend any money or expend any resources. Kliic supports decision-making by FACT! No more guesswork when it comes to your corporate, HR or training initiatives! R.O.I. starts with accurate data. Kliic is a simple and easy to use support tool enabling your organization to raise the bar of excellence. We believe that Anything IS Possible ... with Feedback! Meaningful feedback is really the key to achieving excellence! Kliic.com is a cloud-based platform that allows you to design, build and administer performance-based assessments using your competencies, strategic goals, organizational needs, and skill requirements. The Kliic Platform can be used to create virtually any type of assessment, i.e. 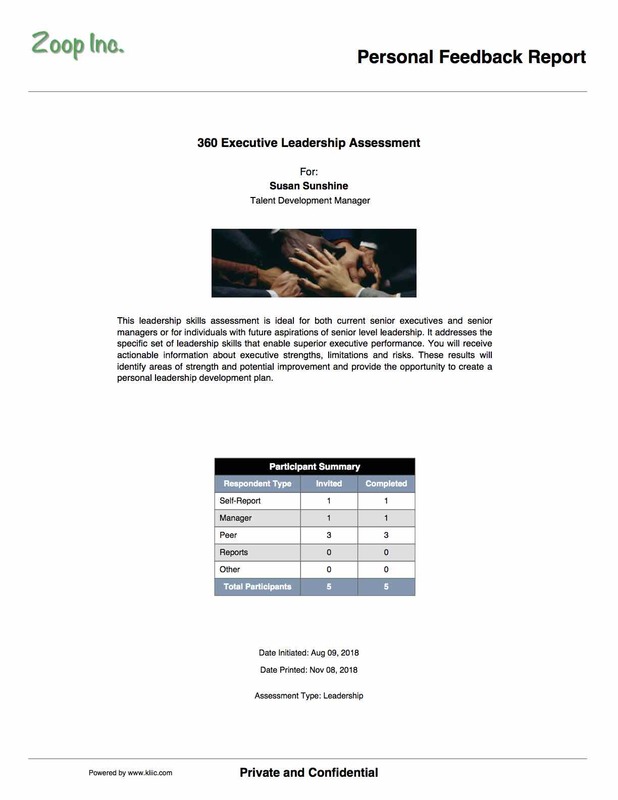 leadership, sales, employee engagement, client service, or any other performance or feedback-based assessment. At Kliic, meaningful only counts when it is meaningful to our clients! 1. 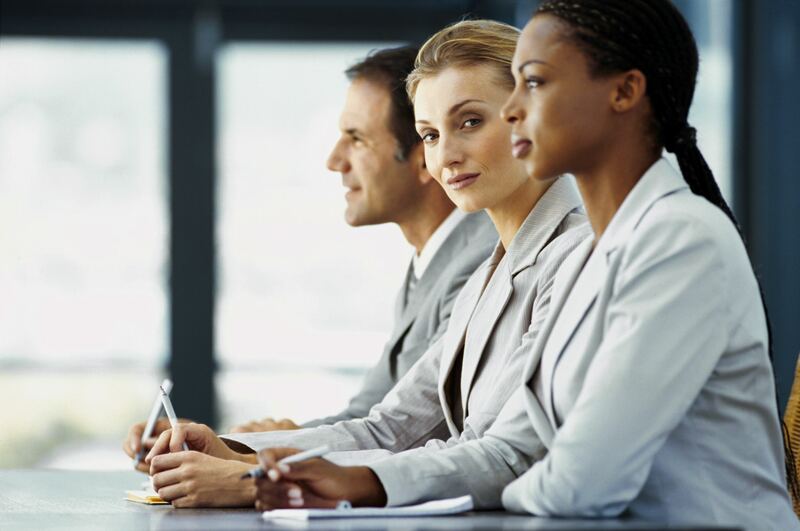 Increasingly fierce competition in developing and retaining top talent. Kliic's design flexibility helps you reduce and potentially eliminate many issues associated with developing and retaining the best talent by allowing you to focus on your specific issues, needs, and goals. 2. Maintaining a focus on growth while reducing head count (existing staff being more productive and efficient). The Kliic tool is designed to support the performance improvement necessary to address productivity and efficiency. It helps you recognize and clearly identify behavioural gaps, interpersonal barriers, and skill challenges. Once identified an effective plan can be created and implemented to address these challenges. The Kliic platform provides real-time results and feedback, giving you immediate opportunity for productivity and efficiency improvements. It's all about helping people be at their best! Understanding Competency Frameworks: A robust competency framework is the glue that holds talent management programs together. If you have an existing competency framework, then Kliic lets you use it. If you don't have one, then the Kliic team will help you build it. Supporting your Brand: With the "Kliic" of a button our platform becomes your platform. Kliic allows you to: customize your user's experience, brand your assessments by adding your logo, add personal messages to assessment invitations, create as many assessments as you need, enable or disable various direct-user input options (for feedback provider comments), send reminders, generate personal reports, generate organizational reports by division, department or group, retain total control over the entire process, and much more! Maximizing R.O.I. : Measurement is the ultimate path to performance! Kliic can be your guide on that path! 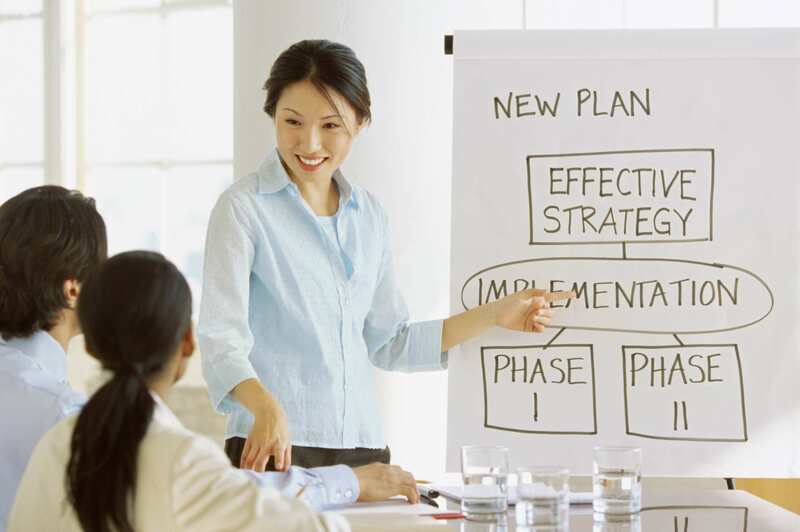 How to connect your learning and development goals to your strategic goals.